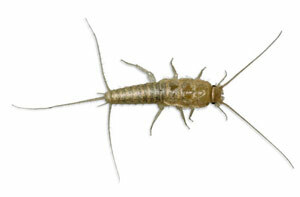 Silverfish are primitive, wingless, 1/2 inch long, silvery scaled, "carrot" shaped slender insects. They adapt to the structural environment readily and thrive in warm, damp locations inside your home. They feed on wallpaper, books, cloth, cardboard boxes and dead insects. Our once a year pest control service with thorough inspection and application will prevent and control these pest in your home. Burroughs Pest Control provides Georgia with expert long lasting pest control services in Carrollton, Marietta, Atlanta, Fayetteville, Forest Park, Peachtree City, Smyrna, Kennesaw, East Point, Mableton, Cedartown, Tallapoosa, Temple, Cave Spring, Grantville, Palmetto, Douglasville and surrounding areas.